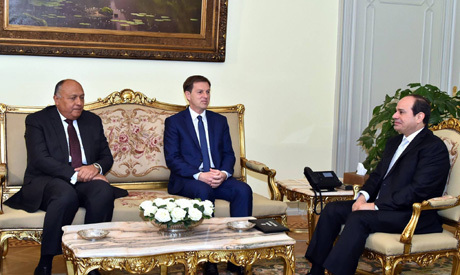 Slovenian Deputy Prime Minister and Foreign Minister Miro Cerar discussed with Egyptian President Abdel-Fattah El-Sisi ways to bolster mutual cooperation in Cairo on Wednesday. Egyptian Foreign Minister Sameh Shoukry attended the meeting with Cerar, who is visiting Egypt for the first time. The officials discussed how to boost trade between the two countries against the backdrop of ongoing meetings of the first round of a joint Slovenian-Egyptian economic committee in Cairo, which was agreed upon during talks between El-Sisi and Slovenian PM Marjan Šarec in Vienna in December. Shoukry and Cerar discussed cooperation in maritime transport, energy, health and tourism, as well as boosting small- and medium-sized projects. They also addressed available investment opportunities in Egypt, the Egyptian foreign ministry said in a statement. The two ministers also signed a consumer protection deal. Slovenian President Borut Pahor visited Egypt for the first time in December 2016, where he discussed boosting trade and economic relations with Egypt during talks with El-Sisi.